The German National Tourist Board has been commemorating the 500th anniversary of Martin Luther’s 95 Theses with a Luther Decade. Beginning in 2008 and ending in 2017, the board has chosen an annual theme around which to organize events and, they hope, lure visitors. The theme for 2015 was “Image and the Bible.” The organizers timed this particular theme to mark the 500th anniversary of the birthday of a painter named Lucas Cranach the Younger. Though he is being feted now, while Lucas Cranach the Younger was living he remained in the shadows of his more famous father, Lucas Cranach the Elder (1472-1553), also a painter, with whom he established the Cranach workshop based in Wittenberg. The duo played a major role in depicting and promoting the message and images of Martin Luther and his contemporaries, hence, their place in these anniversary celebrations. While Martin Luther and his fellow reformers took to the pulpit, the Cranach family workshops used their craft to support their theological and political cause. Their work included conventional (and less so) bible scenes, portraits of Luther throughout his life, and even the woodcuts that illustrated the reformers’ pamphlets and Luther’s German translations of the bible. Lucas Cranach the Elder was a friend of Luther who began depicting the monk starting from his earliest days in the order. After Lucas Cranach the Younger developed his own skills as a painter and printmaker, he worked side-by-side with his father creating some of the most iconic portraits of Martin Luther. Their achievements include the Reformation Altar situated at St. Mary’s Church in Wittenberg, where, historians speculate, Lucas Cranach the Younger received the sacrament of baptism and first heard the sermons of the great reformers. There is even a monument inside this church marking a spot where Lucas Cranach the Younger’s body is thought to have been buried. Lucas Cranach the Younger continued his father’s work beyond the Elder’s death and until Luther himself was dying, as one can see in “Portrait of Martin Luther on his Deathbed” (1546). He went on to expand his father’s workshop into an enterprise where students worked to reproduce the Cranachs’ famous paintings. The Cranach workshop used their printing press to mass-produce their works and distribute the pictorial messages of the Reformation throughout Europe. woman caught in adultery were viewed as scandalous in their time. Showing people actually touching the human form of Jesus ran counter to the infallible papal teaching that emphasized the otherworldly divine nature of Christ. Likewise, Cranach the Younger’s placement of the now famous pictures of Luther and his wife Katharina von Bora side-by-side sent a clear message to the Vatican that the marriage of a former priest and nun could be just as holy as the celibacy practiced by religious orders. 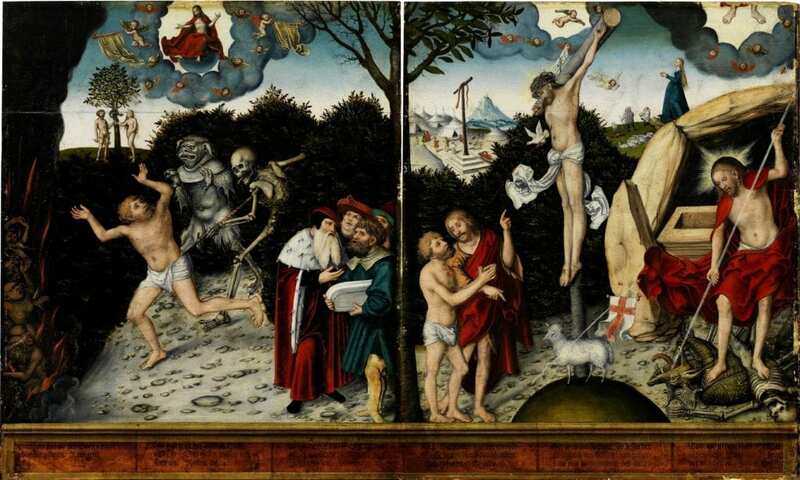 Other paintings with as the Weimar Altarpiece painted by Lucas Cranach the Younger, convey a more explicit theological message. 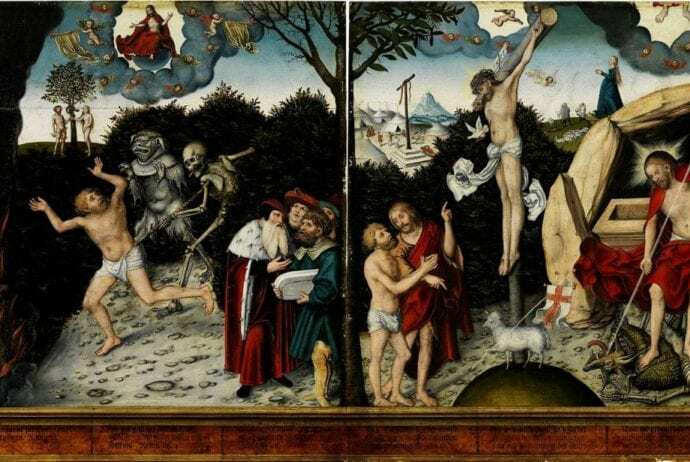 In this painting, he places his father next to John the Baptist with a stream of blood from Christ’s side flowing directly on Lucas Cranach the Elder’s forehead. The implication here is that one can receive salvation directly without the need for intercession from a priest or a saint. Off to the far right, Luther points to a bible passage relating to Christ’s redemptive blood noting how all believers are freed from their sin. The Cranachs’ most iconic piece “Law and Grace” (1529) painted by Lucas Cranach the Elder features the law on the left hand side and grace on the right. In it, the law is symbolized by Moses with the Ten Commandments, Satan forcing a man into hell by Death, and Adam and Eve eating the forbidden fruit and Christ sitting in judgment. Grace is depicted by the blood of Christ covering those near the cross with Christ’s cross crushing Satan and Death. The tree separating the two sections is dead on the left but alive on the right. This painting, deemed by many as the most influential painting of the Reformation, illuminates the decisive and at times deadly, differences between Luther’s followers and the Catholic Church. Some of the Cranachs’ woodcuts drawings were used to illustrate flysheets and bible translations demonstrating an early use of “picture propaganda. 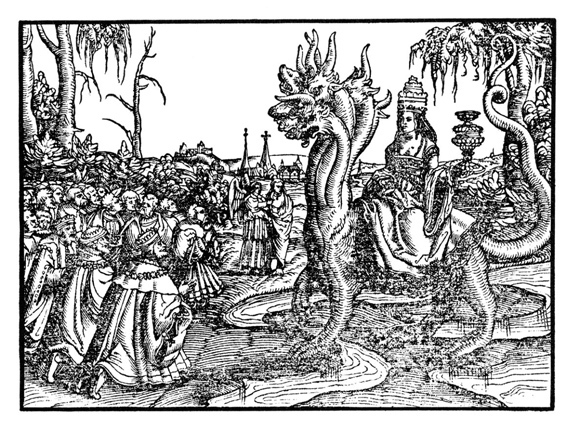 The “September Testament” (1545), Luther’s seminal translation of the bible into the vernacular German language featured controversial illustrations such as one of the Whore of Babylon wearing the papal tiara. The comparison of the Roman Catholic Church with the whore of Babylon can be seen in Reformation writings such as Luther’s pamphlet “Babylonian Captivity of the Church” (1520). Images like these were deemed so scandalous that Luther’s “December Testament” printed several months later contained prints with the offending drawings removed. Likewise, Luther’s “Depiction of the Papacy” (1545) pamphlet features a drawing by Cranach the Younger of Pope Paul II holding a papal bull full of fire and brimstone. In this drawing, German peasants greet the pope with farts fresh from their “belvedere.” (Belvedere references both ‘beautiful view’ and a building in the Vatican.) The pope is portrayed riding a sow and carrying a spiral of steaming dung in his open palm. 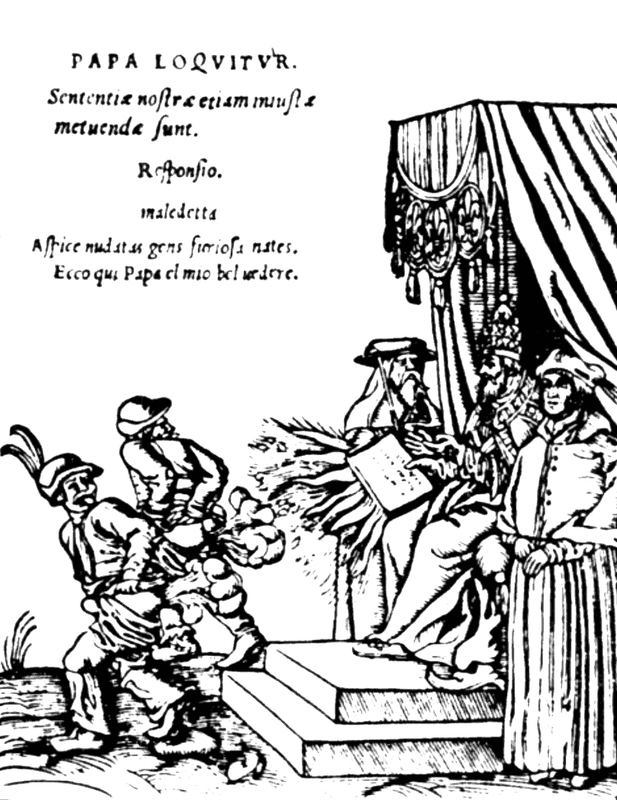 Often Luther spoke of German as the “papal sow’ who was being force-fed papal lies that primarily benefited the Vatican. Those reading this pamphlet clearly picked up the message that while Germany could seek a council from the Pope, all they could expect from the Vatican were deception and lies. Furthermore, it’s been argued this image might have carried anti-Semitic undertones as it brings to mind other satirical depictions of Jews riding on pigs. Perhaps surprisingly, despite the Cranach’s workshop involvement in promoting the reformation, they were still offered and accepted commissions from Catholic patrons. Unfortunately those Catholics who sat for them did not leave behind any writings that would explain where they would ask this workshop to portray their likenesses given the workshop’s controversial portrayals of the Pope. As the Cranach workshop never wrote about their decision to work for those who disagreed with the Protestant themed works they were publishing, one can surmise the Cranach Workshop’s reason for accepting these commissions was purely financial. 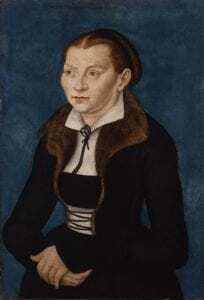 Which makes sense given that, like his father, who served as mayor of Wittenberg and used his political clout to expand his influence, Lucas Cranach the Younger’s goal was to advance the family’s fortune and standing in the community. Hence both men demonstrated their business savvy in ensuring that while promoting the Reformation mission through their workshop, they did not give up opportunities to earn riches with which to expand their own empire. Fortunately for the Cranachs, they had the financial means and political connections to prosper while other reformers faced exile and execution. In viewing displays of the Cranach’s more controversial works, I was struck by how, upon initial glance, Cranach’s depictions of the pope seemed to bear a strong resemblance the more recent Charlie Hedbo cartoons lambasting the prophet Mohammad. However, despite any similarities in style and tone between the Cranach woodcuts and the Hebdo pen and ink drawings, one cannot draw a direct parallel between these two works. The Hebdo cartoonists who depicted the Prophet Mohammad were atheists who were outsiders and not part of the tradition they were satirizing. However, the Cranachs and other reformers shared texts and histories with the Catholic Church, and as such, they functioned as insiders critiquing this schism within their tradition. Furthermore, the Hebdo cartoonists were, as many have said, “punching down” by going after a much maligned and marginalized group whereas the Cranachs were certainly “punching up,” attacking the major governmental and religious power and authority. Yet, both parties used the pen as their weapon of choice. So perhaps we could say that while the Cranach Workshop may have been one of the earliest originators of using picture propaganda, Charlie Hebdo seems to be trying to find a way to carry on into the 21st century this European tradition of using art to criticize religion. You can read Becky Garrison‘s companion piece on the Luther Decade celebrations here.